Our Extreme RTX17 Gaming Laptop Range features the latest Intel Core i7 8th Generation Processers together with the latest Nvidia GeForce RTX2060/2070/2080 Series of Graphics Cards to offer the ultimate in mobile gaming performance. The RTX18 features a backlit keyboard and a 17.3" Screen (Nvidia G Sync 144Hz) and all of this within a laptop that measures only 19.9mm thick. Select the options to suit your requirements of budget to design the ultimate gaming laptop for you. 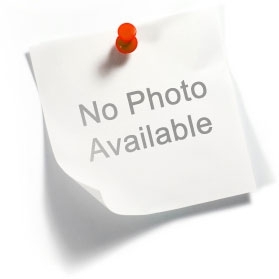 You will earn 2288 Loyalty Points for purchasing this product. 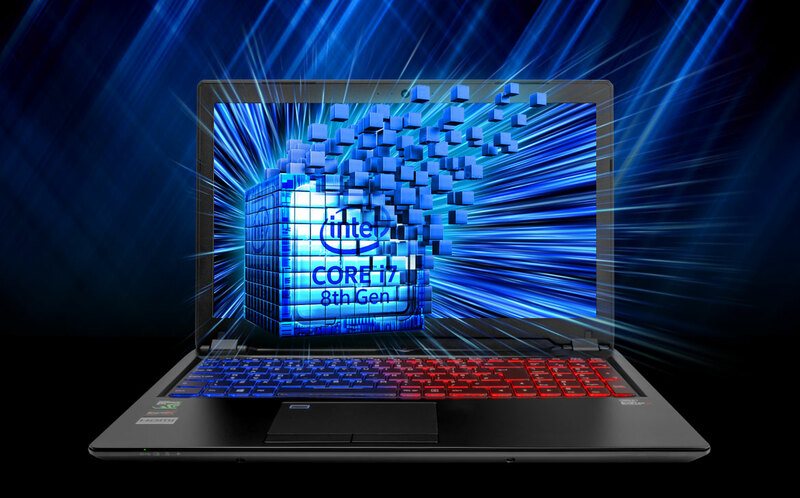 Designed for high end gaming, the 17.3" VX17 features a powerful Intel® Core™ i7 CPU coupled with the very latest NVIDIA® GeForce® GTX graphics. Together, this makes the 17.3" VX17 an extremely powerful notebook that can handle almost anything you can throw at it. Select the options you require to create your exact specification and requirement by choosing the options from the drop down menus. Designed for high end gaming, the 17.3" VX17 features a powerful Intel® Core™ i7 CPU coupled with the very latest NVIDIA® GeForce® RTX graphics. Together, this makes the 17.3" VX17 an extremely powerful notebook that can handle almost anything you can throw at it. RAM (RANDOM ACCESS MEMORY) is important to all desktop pcs and laptops. The more memory installed in your system the more information can be processed simultanously. This means the your applications for gaming and productivity run faster based on the amount of memory installed in your system. DDR4 system memory installed in our PCs is manufactured by Crucial or Adata and if covered for up to 3 years under the terms of our hardware warranty. We recommend 4GB for Home or Business PCs as the minimum and 8GB as the minimum for Performance Gaming PCs. Graphics Workstations or High End Gaming PCs should have 16GB for optimum performance. The speed of the memory is less important with low to mid range PCs and Laptops however with high end Graghics Workstations & Gaming PCs the speed of the memory will marginally improve performance. If your PC has integrated graphics it is important to consider higher speed memory to improve the performance of the graphics on the system as the graphics processor shares the system memory. ECC VS NON ECC Memory. ECC Stands for Error Correcting Code and for Home , Gaming & Business Desktop PCs NON ECC memory is standard and offers reliable performance. ECC memory is primarily used in high end Intel Xeon Workstations and Servers and offers a level of protection which is not required by most users. LATENCY. The lower the number the better the performance. CAS-LATENCY refers to the delay time between the moment a memory controller tells the memory module to access a particualr column on the memory module and the moment the data from the given array location is available to the memory modules output pins. It is not imporant to understand this and just remember the lower the number the better the performance. HEAT SPEADER. Heat Spreaders / heat sinks on memory modules is designed to lower the temeprature and increase the life and reliability of the memory module. If a PC will be turned on an in operation continiously then the heat spreader would be considered a requirement. If however the PC is for normal home , business or gaming use this is an optional extra. Hard Disk Drives are a storage solution that can be used to store data such as video files , documents and applications as well as operating as your Boot Drive for Windows 10. 2.5" Hard Disk Drives offer low cost per Gigabyte over Solid State Drives and therefore offer an ideal solution for all types of PCs and Workstations. The advantages of 2.5" Hard Disks drives are reliability and vast storage capability up to 4 Terabytes of a single drive. The disadvantages over SSD ( Solid State Drives ) is access speeds and therefore the ideal solution for extra performance is to have a small SSD drive which will be used for Windows and Applications and then use the 3.5" Hard disk to store your data. If you only have one drive in your PC then that drive should be a Hard Disk Drive which will give you vast storage space and reliability for many years. Solid State Drives (SSD) drives offer vastly faster data transfer over traditional 2.5" and 3.5" Hard Disk Drives adding an SSD to your PC or Laptop is improve the performance when used as your Boot Drive for Windows 10. An SSD drives consists or flash memory chips and has no moving parts were a traditional drive internally has platters and and moving heads. The main disadvantage of the SSD is the storage space is small when compared to traditional Hard Disk Drives however the speed advantage far outweighs the space limitation. The SSD can be used to only have your Windows 10 Installation and your Applications installed on it which will reduce the space required and at the same time vastly improve the performance of your PC. SSD drives are available in two types with the first being a 2.5" SSD which connects to your PC through an Internal SATA slot and the second type connects internally into an M.2 Slot. The Sata version is limited to 6GB/s with the M.2 having a theoretical speed of up to 32GB/s. The best performance is to have your Windows 10 Installation on an M.2 SSD which is offer blistering fast speed booting and within Windows Application. The Inclusion of an SSD drive will improve the performance for Gaming , Home , Educational and Business use. If your PC or Workstation will be used for graphics it is recommended that the Windows 10 Installation be on the SSD and the data stored on a secondary Hard Disk Drive. Optical Drives are DVD and BluRay drives and come in different versions such as DVD+RW which can read and write onto DVD discs . BluRay drives come in two versions with the first being a BluRay Combo drive which can read DVD and BluRay discs and write to DVD however a COMBO drive cannot write to a BluRay disc and the second being a BluRay Writer which can read and write to both DVD and BluRay discs. Optical drives are fast disappearing from both desktop pcs and laptops as the technology has been superceeded by USB Memory drives and SD Memory Cards. When purchasing a desktop pc you can select to have a DVD or BluRay drive installed once the PC Case is designed to house the drive. If the PC Case does not house the drive you will see an option to purchase an external USB DVD or BluRay Drive that will connect to the USB port on your PC. If you are purchasing a modern laptop the only only is for an external USB DVD/BluRay. If you want to play DVD Movies on your desktop PC or Laptop you will need a BluRay Combo Optical drive. The options listed here are to add an M.2 Internal Wifi Card to a laptop PC with speeds from 300Mbps to 1300Mbps. The bigger the Mbps the faster the transfer rate between your router and your PC however the speed is limited by the maximum speed the router is capable of therefore if you install a 1300Mbps Wifi Card in your PC and your Router only supports 300Mbps then your maximum speed between the router and the PC will be 300Mbps. Fibre broadband is available from 50Mbps to over 1000Mbps and therefore if you have a service capable of more than 300Mbps you should choose a Wifi card which matches your available speed. If you are in doubt a quick call to your internet service provider should answer the question of which wifi card to choose. For Home , Gaming , Educational and Business applications the 300Mbps is more than sufficient for a smooth experience. There are 2 different versions of Windows 10 available with the Home Edition for Home Users and the Professional Edition for Business users. There are differences between the versions and click on the image below of each will answer questions. There are 2 major differences with Professional including more networking capability as well as BitLocker which is designed to protect your data through encryption. We supply Genuine Windows 10 Editions and when ordered with your PC you will receive a DVD containing Windows 10 should you need to reinstall and also a COA ( Licence Code ) which we will attach to your PC. When you order Windows 10 with your new PC or Laptop we will install Windows 10 as well as the latest device drivers and complete any required updates to ensure you get your PC in a ready to use state. We are registered with Microsoft and we only purchase our Windows products from Microsoft Appointed Distributors to ensure the autenticity of the product. We recommend Windows 10 as an important choice when buying a new pc and should you select not to have us Install Windows 10 on your PC it is important that you ensure you will be install the correct version which is licensed for use on your PC. We install Windows 10 64-Bit OEM Editions of both Home and Professional. We offer either a 2 , 3 or 5 Year Warranty with our Custom Desktop PCs and Laptops. Our 2 Year Warranty offers cover on all of the components (hardware) for 2 years along with Next Business Day Collection and Return with Nightline.ie as well as labour for the full 2 years. Our 3 Year Warranty offers cover on all of the components (hardware) for 2 years however includes Next Business Day Collection and Return with Nightline.ie and labour for 3 Years. 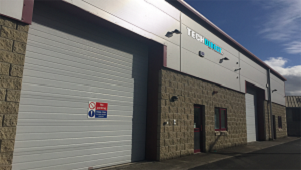 Our 5 Year Warranty offers cover on all of the components (hardware) for 2 years however includes Next Business Day Collection and Return with Nightline.ie and labour for 5 Years. Please note this is a hardware warranty only and does not cover reinstallations of Windows 10 , drivers , or third party applications. We also Include Lifetime Technical Support with each system and should anything go wrong even outside of the warranty period you can contact us and we will endeavour to help. We always here to help whether inside of outside of warranty and all of our PCs & Laptops come with Lifetime Technical support for no extra cost. HARD DISK CAPACITY 1 x 7mm 2.5"
Our Extreme RX17 Gaming Laptop Range features the latest Intel Core i7 8th Generation Processers together with the latest Nvidia GeForce RTX2060/2070/2080 Series of Graphics Cards to offer the ultimate in mobile gaming performance. The VX17 features an rgb keyboard and a 17.3" Screen and all of this within a laptop that measures only 19.9mm thick. Select the options to suit your requirements of budget to design the ultimate gaming laptop for you. 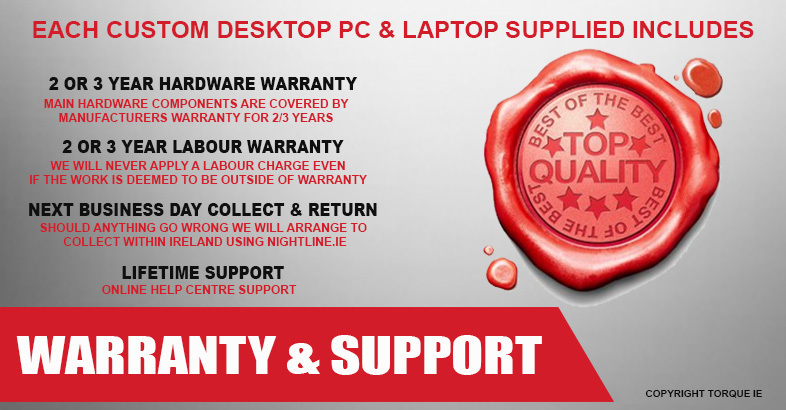 Our Custom Designed & Irish Built Desktop PCs & Laptops come with a 2 Year Manufacturers Hardware Warranty that covers all Internal components Including Motherboard , Processor , Memory , Hard Disk Drives , Solid state Drives , Power Supplies & Graphics Cards. Labour is included for this period also however please note that software/applications and or third party devices/software are not covered by our warranty. Collect & Return Warranty is included with all of our Custom Desktop PCs & Laptops. If you experience a hardware issue with your PC during the course of the warranty we will collect the Desktop PC or Laptop next Business day and bring to our facility for inspection and repair. Please note that software/reinstallation is not covered and may be subject to a transport charge and labour. You can request a collection by completing a repuest on our RMA website or by clicking HERE. All of our Custom Desktop PCs & Laptops comes with Lifetime Support which is available by visiting our HELP CENTRE. We can offer support and advice across many areas including Windows Reinstallation , Upgrade as well as repairs. Our Custom Desktop PCs & Laptops are built in our purpose built facility in the Republic of Ireland by experienced professional using only Tier 1 components from the Worlds Leading Manufacturers Including AMD , Asus , Asrock , Adata , AeroCool , Cooler Master , EVGA , Gigabyte , Intel & Nvidia. Our Desktop PCs & Laptops are 100% Windows 10 Certified and come with Windows 10 Preinstalled. If however you purchase your PC withour Windows 10 you will not receive a Windows 10 Licence or DVD and the preinstalled version will expire within 15 days. We recommend our customers to always purchase Windows 10 with their new desktop pc or laptop. Our Custom Designed Desktop PCs & Laptops are designed to offer future upgradability to extend the life and performance for many years to come. Desktop PCs offer the ultimate in future upgrade options that includes Memory , Motherboards , Processors , Hard Disk Drives , Solid State Drives , Graphics Cards , Cooling Solutions & Power Supplies. Custom Designed Laptops offer less upgrade options with upgrades limited to Memory , Hard disk Drives & Solid State Drives.